There are numerous freewares that can do single file conversion or in batch. If you have tried few of them but none of them can meet your expectation, you may want to give this freeware a try. 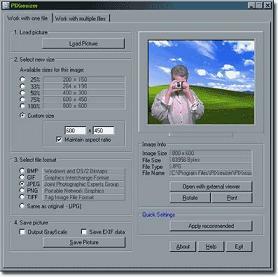 Named as PIXresizer, it can help users to convert original image files into any smaller resolution at different formats in simple steps. Users can select to convert a single file or multiple files depending on preference. Either way, there are only four steps to follow. First, load the picture that you intend to convert. For Multiple files, users can browse for the source and destination folders so that all of them can be converted at once without the need to do it one by one. Secondly, select the new size of the files that you want it to be converted into, either in shrunk percentage or resolution. For instances, users can select to output 50 percent, or 1632 X 1224 resolution only if the original source resolution is 3264 X 2448. Thirdly, select the file format from famous BMP, GIF, JPEG, PNG and TIFF. Alternatively, users can choose to maintain original format as per the source copy. Last but not least, just save the converted images by either output to GrayScale or EXIF data and that is all. This is quite useful whenever users want to find quick way to shrink down overall file sizes without degrading much of its original source quality. If you think this is helpful, do get a free download here.